Several definitions of Eastern Europe exist today, but they often lack precision, are too general, or are outdated. These definitions vary both across cultures and among experts, even political scientists,  as the term has a wide range of geopolitical, geographical, cultural, and socioeconomic connotations. 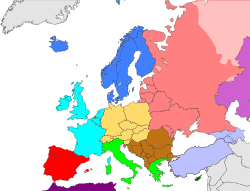 UNESCO,  EuroVoc, National Geographic Society, Committee for International Cooperation in National Research in Demography, STW Thesaurus for Economics place the Baltic states in Northern Europe, whereas the CIA World Factbook places the region in Eastern Europe with a strong assimilation to Northern Europe. 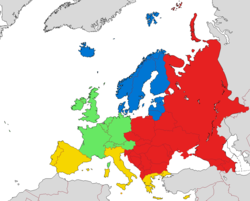 They are members of the Nordic-Baltic Eight regional cooperation forum whereas Central European countries formed their own alliance called the Visegrád Group. The Northern Future Forum, the Nordic Investment Bank, the Nordic Battlegroup, the Nordic-Baltic Eight and the New Hanseatic League are other examples of Northern European cooperation that includes the three countries collectively referred to as the Baltic states. The Caucasus nations of Armenia, Azerbaijan, and Georgia are included in definitions or histories of Eastern Europe. They are located in the transition zone of Eastern Europe and Western Asia. They participate in the European Union's Eastern Partnership program, the Euronest Parliamentary Assembly, and are members of the Council of Europe, which specifies that all three have political and cultural connections to Europe. In January 2002, the European Parliament noted that Armenia and Georgia may enter the EU in the future. However, Georgia is currently the only Caucasus nation actively seeking NATO and EU membership. Some countries in Southeast Europe can be considered part of Eastern Europe. Some of them can sometimes, albeit rarely, be characterized as belonging to Southern Europe,  and some may also be included in Central Europe. With the fall of the Iron Curtain in 1989, the political landscape of the Eastern Bloc, and indeed the world, changed. In the German reunification, the Federal Republic of Germany peacefully absorbed the German Democratic Republic in 1990. In 1991, COMECON, the Warsaw Pact, and the Soviet Union were dissolved. 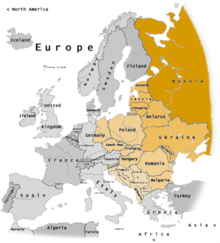 Many European nations which had been part of the Soviet Union regained their independence ( Belarus, Moldova, Ukraine, as well as the Baltic States of Latvia, Lithuania, and Estonia). Czechoslovakia peacefully separated into the Czech Republic and Slovakia in 1993. Many countries of this region joined the European Union, namely Bulgaria, the Czech Republic, Croatia, Estonia, Hungary, Latvia, Lithuania, Poland, Romania, Slovakia and Slovenia.